Next up on A’s list is the criminally gifted Groban, who rode that hurtling, stellar rocketship of a voice straight to superstardom nine years ago and hasn’t once looked back. A devastating chronicle of grief (and of the hope which can emerge from it unscathed), this was his very first number one single, and the first real hint at what was to come from one of the new century’s tremendous burgeoning talents. Continuing with the theme of A’s favorite artists brings us to everybody’s favorite Celtic lass, who scores an exquisitely ethereal knockout by reminding us, simply, that there’s no time — time to turn it around, time to fall in love, time to remember to be alive — like now. 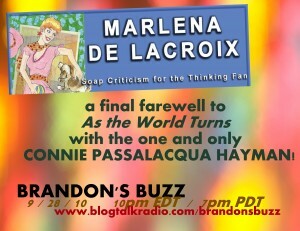 on brandon’s buzz! 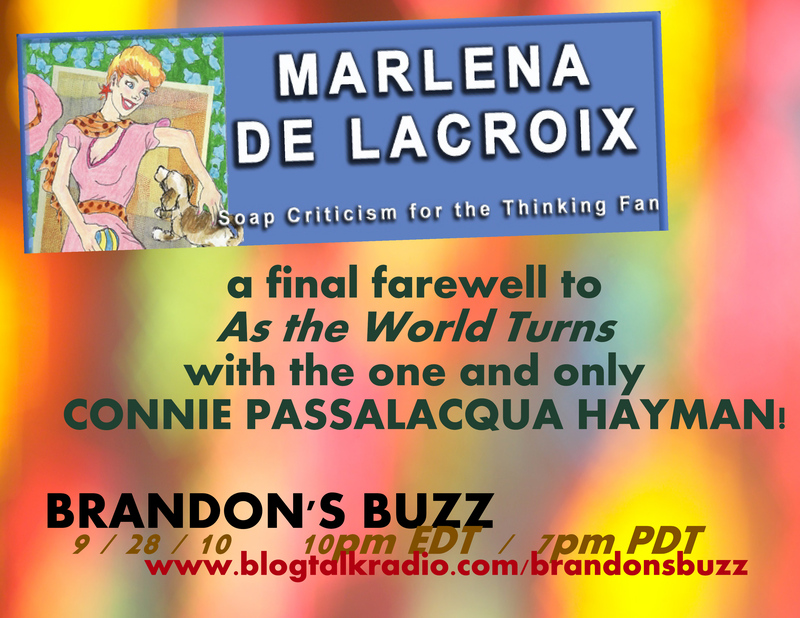 9/28/10, 10pm edt / 7pm pdt! i love you, is that oh-kay? A was so happy with yesterday’s Rob Thomas entry that he decided over dinner last night that all dispatches from the hive this week should consist of music from his favorite artists, a list of which he painstakingly laid out for me while we chomped on Chipotle. Because he’s not generally given to enjoying pure light-hearted pop, his unfettered adoration for Ms. Bedingfield borders on alarming, but there’s no denying the ecstatic, exhilarating joy emanating from her fierce debut single, a dynamite ditty all about the process of writing a dynamite ditty. A texted me yesterday and demanded to see Mr. Thomas pop out of the hive pronto. (And since Rob was the primary inspiration for what you’re currently reading, it seemed like a reasonable request.) I wouldn’t dare call “Problem Girl” the best song on Rob’s electrifying solo debut record, but his stirring, passionate vocal performance really sells the thin story being told here. This was my favorite track the first time I listened to the album five years ago, and having just listened to the entire thing again trying to decide which song to choose, I have to tell you: it still is. Over the past three decades, nobody in his genre can touch Strait for his enduring commercial success, and I reckon this tune tells all you need to know about why he has flown so high for so long: simple, clean melodies (that, incidentally, stick inside your skull on contact), straight-ahead, no-frills production, and an ageless voice that never wavers. Sherry Ann’s old faves — who, incidentally, are back next week with a new album — leap out of their emo box with a haunting, powerful paean to a fallen friend. A towering triumph from a band just then coming to grips with the fact that they were capable of creating incendiary beauty through song. At the zenith of her comet-like commercial trajectory, Miss Alanis popped into MTV’s revolutionary (and profoundly missed) music program and unleashed this staggeringly sincere chronicle of a charismatic young male acquaintance. My forever favorite blogger Glenn McDonald once noted that Morissette has never quite figured out how to write lyrics that don’t sound like twisty lists, and while I generally agree with that, I would add as a quick addendum that, more often than not, she has cannily worked that fact to her best advantage over the course of her blistering discography. — Oscar-winning actress Gwyneth Paltrow, explaining to Entertainment Weekly how she prepared for her role in the upcoming film Country Strong (due December 22), in which — shades of Crazy Heart? — Paltrow portrays a down-on-her-luck Nashville songbird looking for lightning to strike twice. With sweet, knowing nods to Otis Redding and Johnny Cash, the riveting and utterly remarkable Taylor Hanson — once again, the finest pop singer under thirty on the planet right this second, and don’t even try to sway me in a different direction — delivers a graceful, gorgeous ode to the undeniable power of song. In a strikingly brilliant turnabout, Peters — all warm feminine energy and china-doll delicacy — transforms Eric Clapton’s quietly fiery blues ballad into a gentle, peaceful prayer.